If you are interested in log siding for your home in Santa Fe, New Mexico, or a surrounding area, turn to the experts at ABC Seamless of Albuquerque. 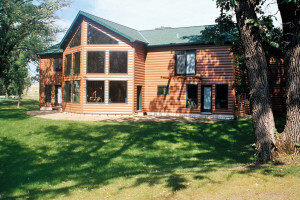 We offer a highly durable faux wood log style cladding that will enhance the appeal of your home with a classic aesthetic while also granting the many benefits of our seamless steel siding. What’s more, our impressively engineered log siding will also be able to provide your home with enhanced energy efficiency thanks to its foam-backed insulation. Our insulated cladding will effectively reduce the transfer of heat into and out of your home, which could even lead to lower monthly energy bills. For more information about the aesthetically appealing log siding that we can offer to homeowners in Santa Fe, NM, and the surrounding areas, contact ABC Seamless of Albuquerque today. A knowledgeable member of our team will happily answer any questions you may have. Alternatively, feel free to stop in at our showroom to see all of our cladding products in person.